The Avg. Group Discount is 32.8%! excellent hotel for the value. 14-Jan-2019 Verified Review, stayed from Sat Jan 12 to Sun Jan 13 2019 at a C$124.99 group rate (19% discount). "Staybridge Suites Guelph Wasn't Impressed!" I organized a group rate for my son's lacrosse team. The price was average for this hotel. The guest services manager (can't remember her name) was rude. Other front desk staff were rude and it seemed like we we bothering them. The pool was NOT heated, I have a pool at home and the temp was maybe 80. Shouldn't be 80 firva heated pool Talbot size. We had to call the front desk to get out towels changed, we left at 1:30 and no one had come yet. When they did come, they did not give us an extra roll of toilet paper or more coffee. We didn't notice until we ran out of TP Sunday morning. The only good things there were the breakfast and Gord Wood. Unfortunately my dest son's lacrosse team will be staying there in June so we will see of things are any better. Chris Kereluk. 28-May-2018 Verified Review, stayed from Fri May 25 to Sun May 27 2018 at a C$139.99 group rate. 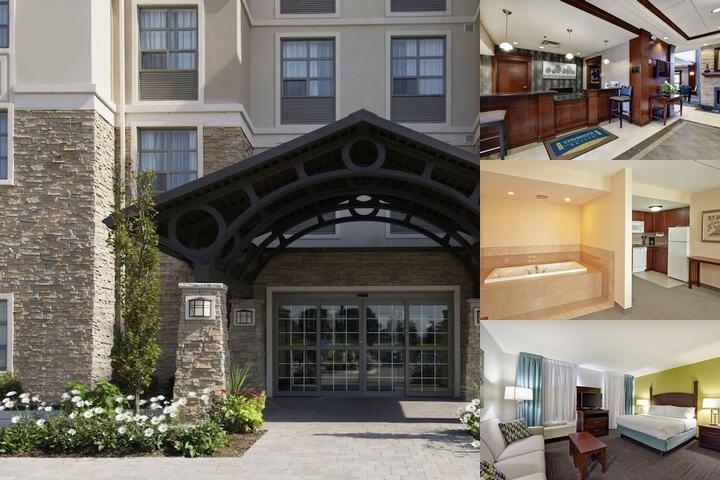 Welcome to the newest hotel in Guelph, the Staybridge Suites Guelph, Ontario. Our Guelph, Ontario hotel has all of the amenities and services you may need to enjoy your extended stay in the Guelph area.Our Guelph hotel's upscale accommodations include a selection of spacious suites with fully equipped kitchens, complimentary daily hot and cold full breakfast buffet, evening Sundowner hospitality receptions (Tuesday-Thursday), convenience store, 24-hour business centre, and complimentary wired and wireless Internet access to keep you in touch with home and the office.The Staybridge Suites Guelph, Ontario has perfected the extended-stay experience by offering extras like spacious work desks in each room, home theatre, complimentary guest laundry facilities, heated indoor pool, and an on-site fitness facility with a limited selection of equipment. If you require advanced equipment for your workout, we have made arrangements with the nearby local YMCA for discounted membership rates.To further enhance your stay, our Guelph hotel offers a grocery shopping service and direct dial phone numbers for rooms. We even have an outdoor putting green to keep your game sharp while you're on the road. Don't worry about finding a kennel for your dog as we are a pet friendly Guelph hotel. Pets allowed at a one time fee of $35CAD per stay upto 7 nights. Anything beyond 7 nights is $60CAD. The Staybridge Suites highlights above are subject to change without notice. 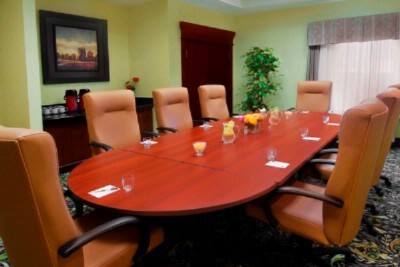 Below are the meeting, banquet, conference and event spaces at Staybridge Suites Guelph. Feel free to use the Staybridge Suites Guelph meeting space capacities chart below to help in your event planning. Hotel Planner specializes in Guelph event planning for sleeping rooms and meeting space for corporate events, weddings, parties, conventions, negotiated rates and trade shows. Board room setup is the most ideal. 24 x 18 x 16 Ft. Outdoor Patio with Bar be Que and Putting green facilities.Ideal from June till September. 50 x 25 x 0 Ft.
25 x 12 x 10 Ft.